Describing the views in Praiano is just about impossible. No matter where you are — from our rented house, the piazza in front of the church, our favorite Bar del Sole and the restaurants and hotels, you can see Capri in the distance and nearby Positano. 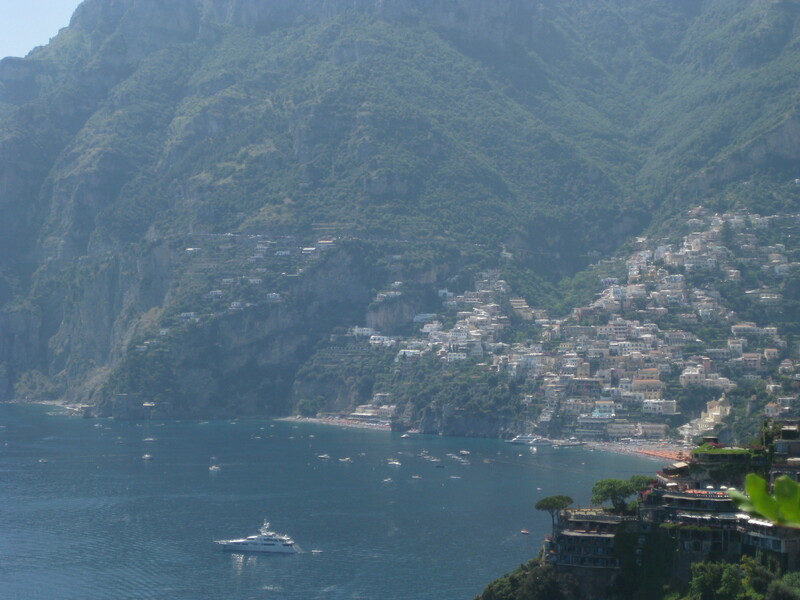 The hotels San Pietro and Tritone are visible and built into the cliffside overhanging the water. At night the sun sets on the mountain behind Positano. And of course there is the sea. 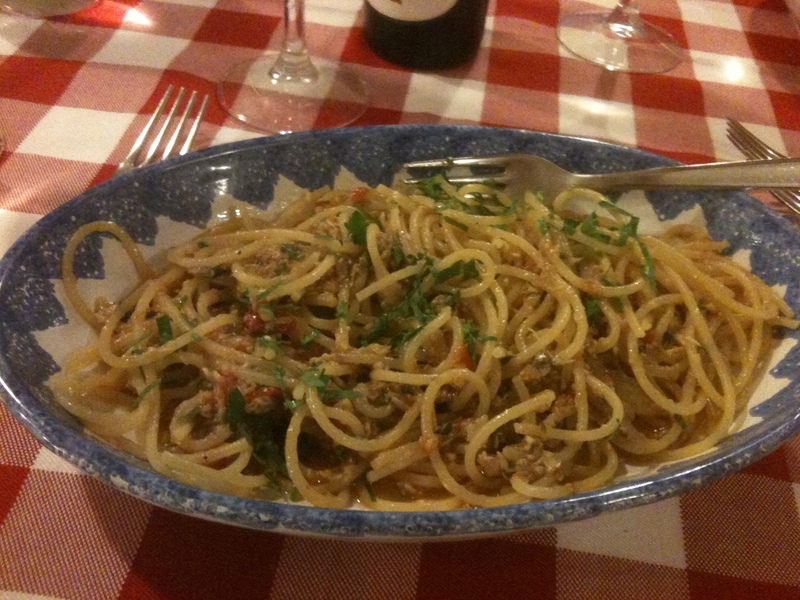 The first and last restaurant we always go to in Praiano is La Brace, a local trattoria. We first discovered it in 1983. Like just about everything in the town, the restaurant is up a flight of stairs. 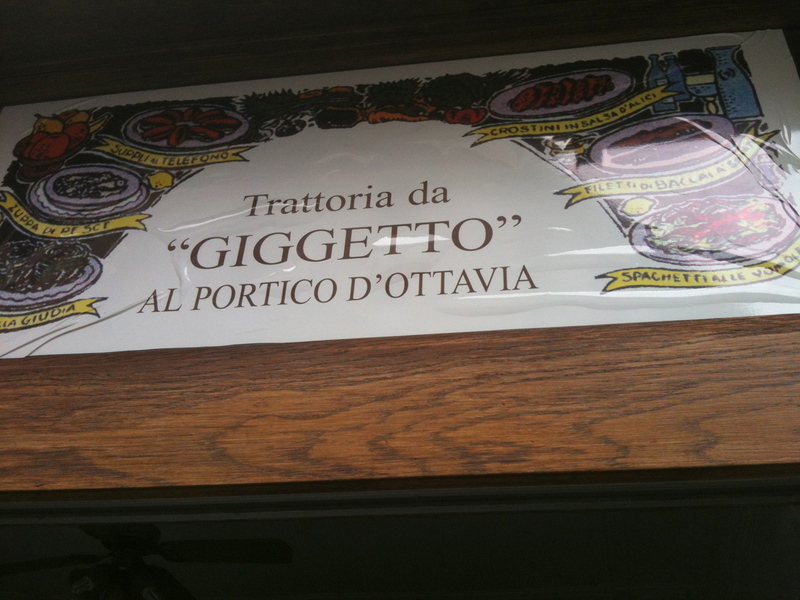 This was the beginning of my “Alici Period.” Alici, for the uninitiated, is another word for acciughe, or anchovies. These were fresh caught, not preserved, and have a rich flavor that is quite different from the kind in tins. 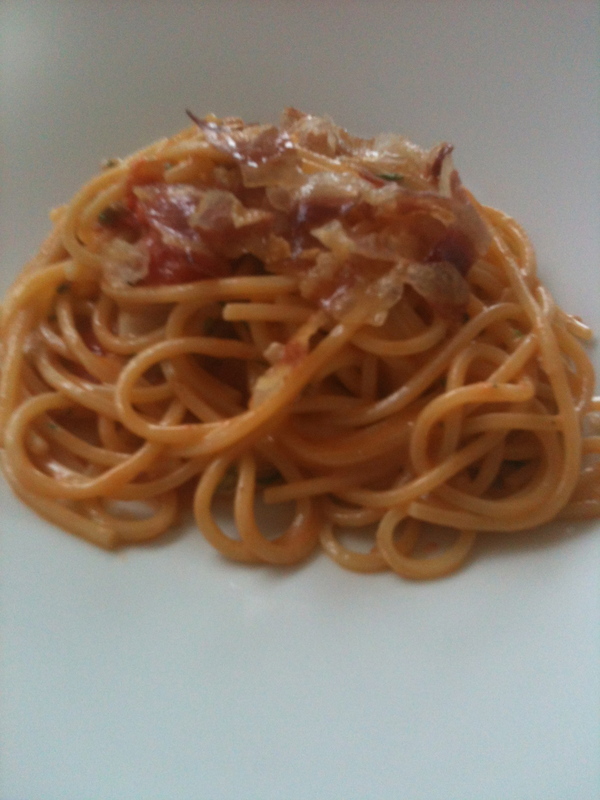 I had spaghetti con alici and tomato followed by perfectly fried alici which were so good I almost ordered more. Instead I ate some of Michele’s. 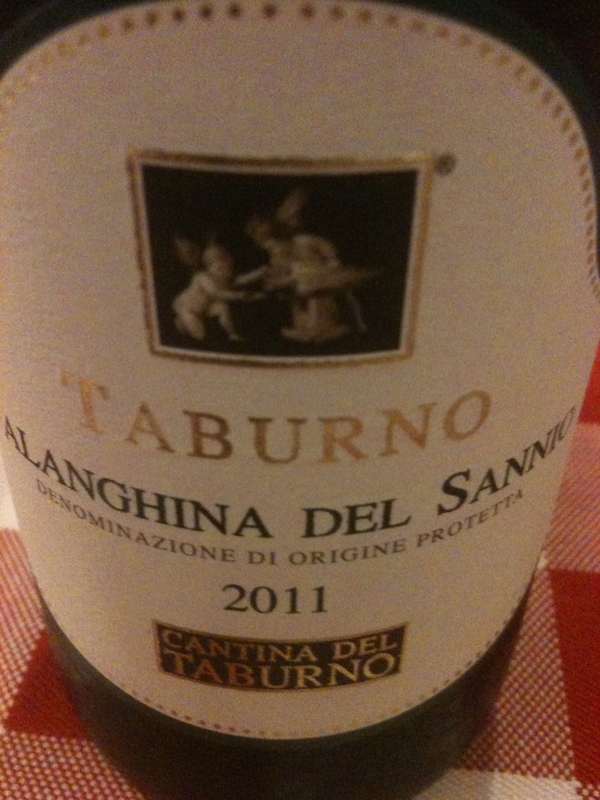 We drank Falanghina del Sannio 2011 from Cantina Taburno and on the second visit Greco di Tufo 2010 from Mastroberardino. 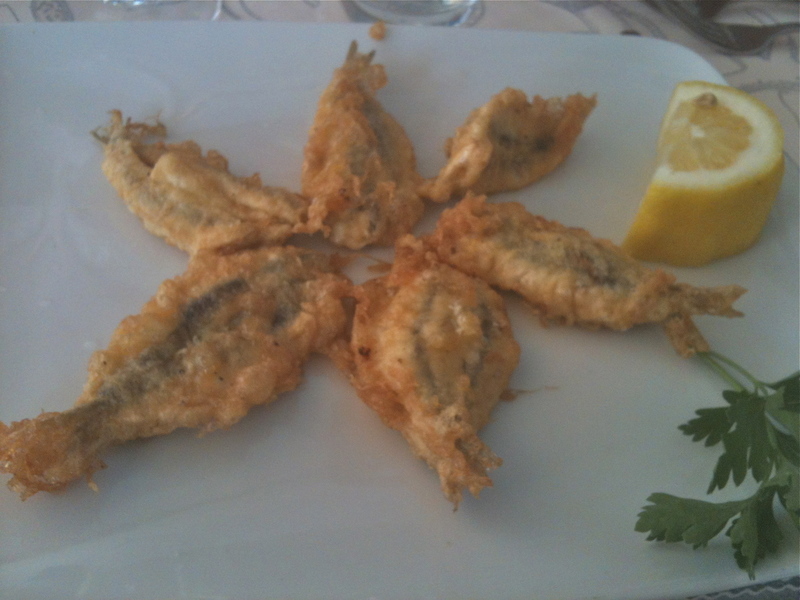 We also had fried alici on the second visit. Michlele ordered octopus (polpo) salad- she would order it often in different preparations on the trip. She also had the spaghetti with zucchini, a local specialty. This may have become our new favorite restaurant. It is outside Positano and we decided to walk. The road offers great views that you do not see from the bus or a car and you can stop and admire them. However it is over 2km, there are no sidewalks and the road is narrow, and most of it is uphill. We took the bus back and both ways the second time we went. Michele had the insalata polpo, octopus salad here also, followed by ravioli with baccala. I saw on the menu chitarrine amatriciana with smoked guanciale from Sauris, a town in Friuli renowned for its smoked meats, and fish. I just had to order it. Michele explained that chitarrine are homemade spaghetti made on a device known as a chitarra, which uses guitar-like strings to cut the pasta. 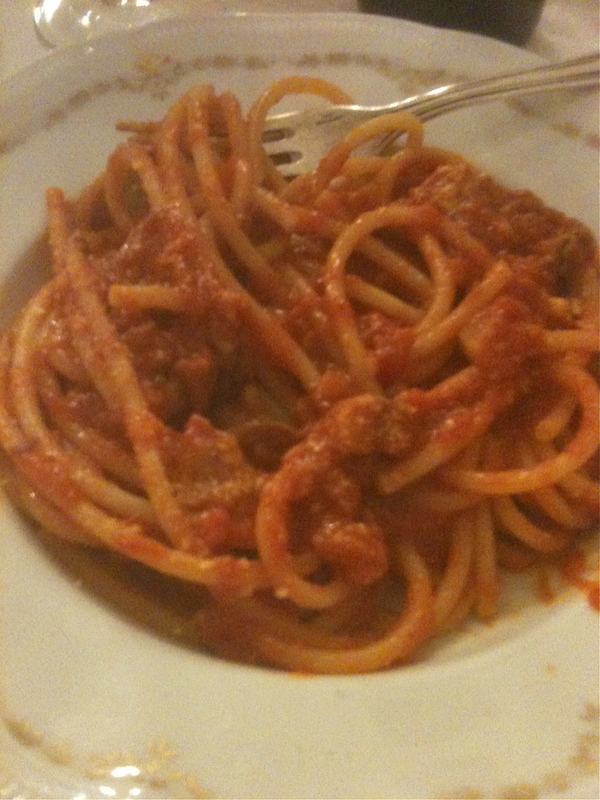 This version was better than the amatriciana I have eaten in most places in Rome. 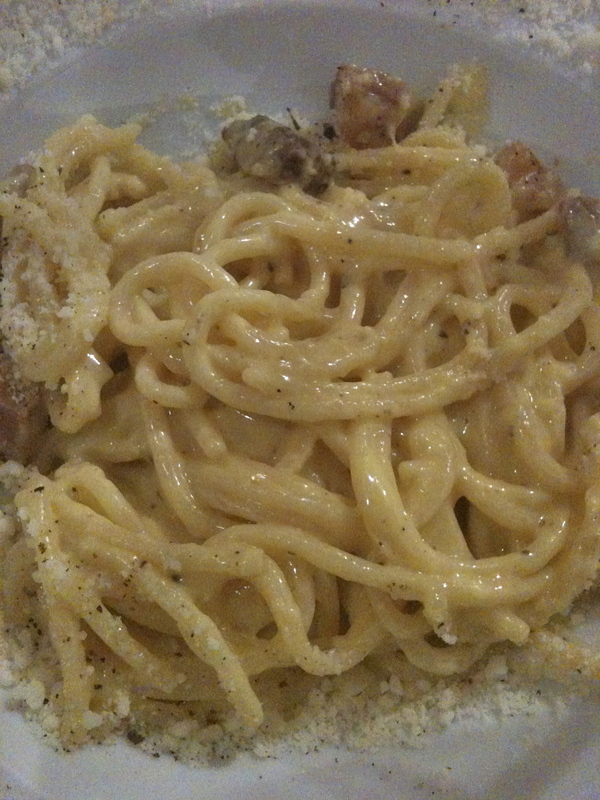 In fact it was so good I ordered it the second time that we ate here, along with the baccala in tempura batter. 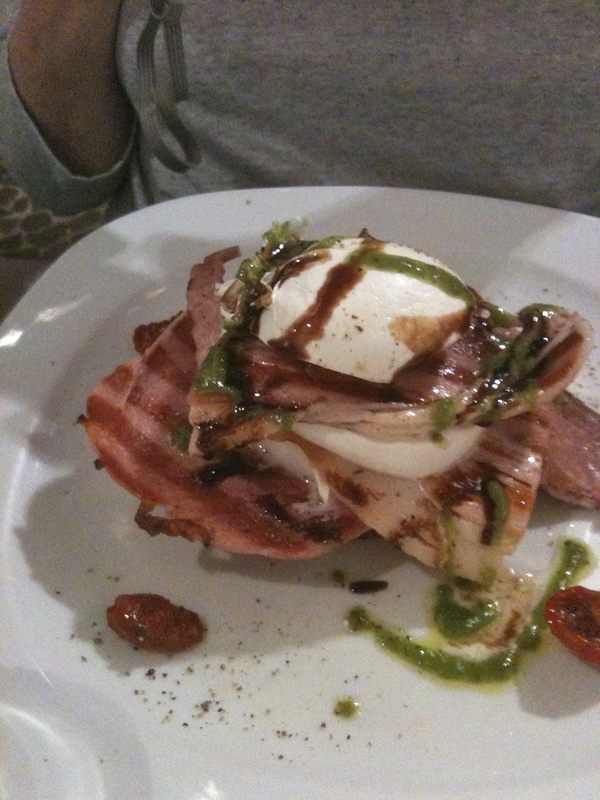 Light and puffy, this was a great main course. 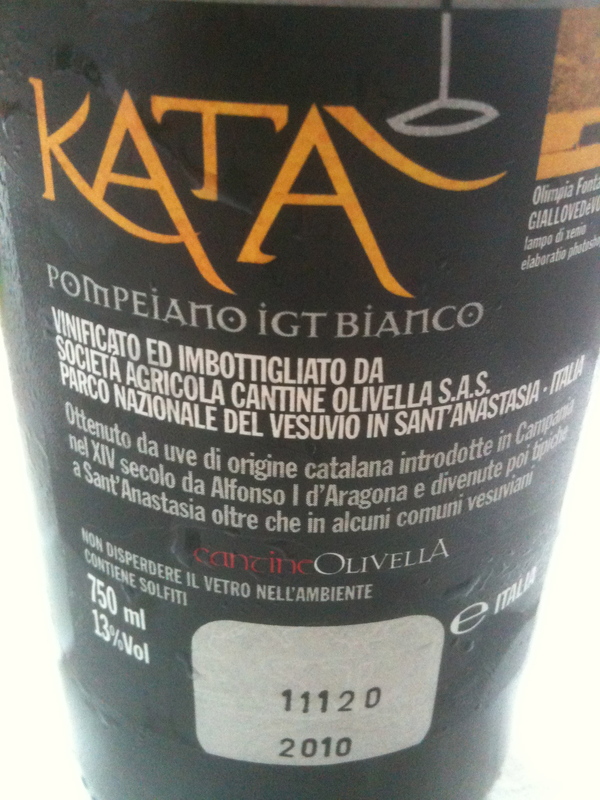 Both times we ate at La Taverna del Leone, we had the same wine Pompeiano Bianco IGT “Karà “ 2010 100% Catalanesca from Societa Agricola Cantine Olivella. 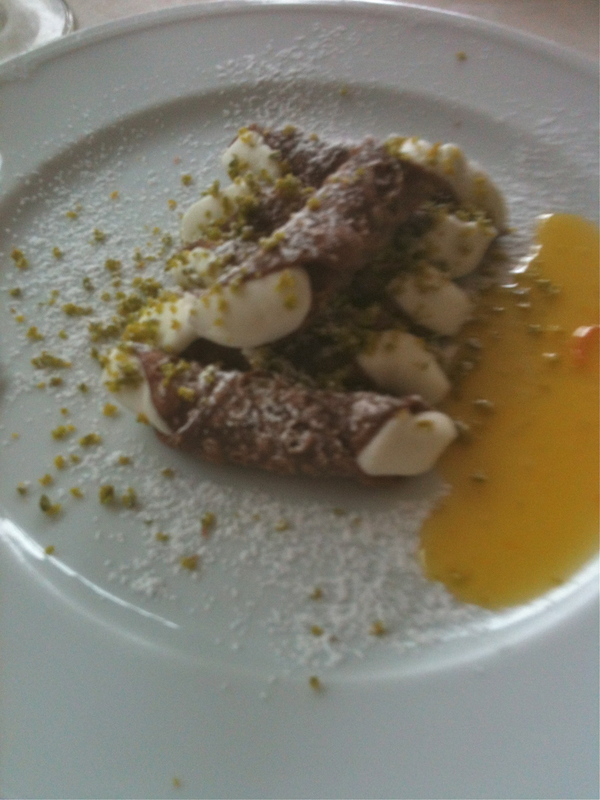 For dessert we had the cannoli filled with bufala ricotta. They were so good; I ordered them both times, too. Lido Azzurro is a very nice restaurant on the water overlooking the port in Amalfi. 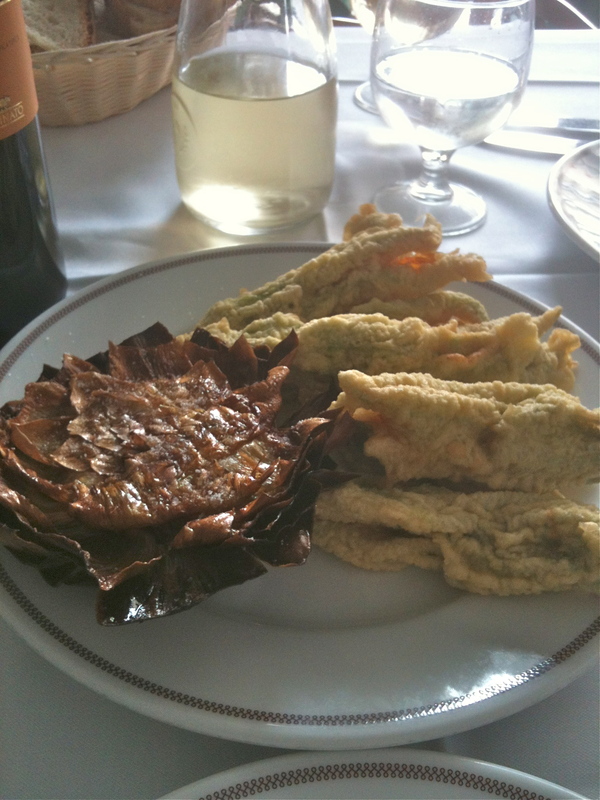 We sat outside and I ordered the alici fritti con ripiene di provola fume, fresh anchovies stuffed with smoked mozzarella, spaghetti alle vongole, with clams, and scampi e gamberoni sulla griglia, grilled shrimp and langoustines. 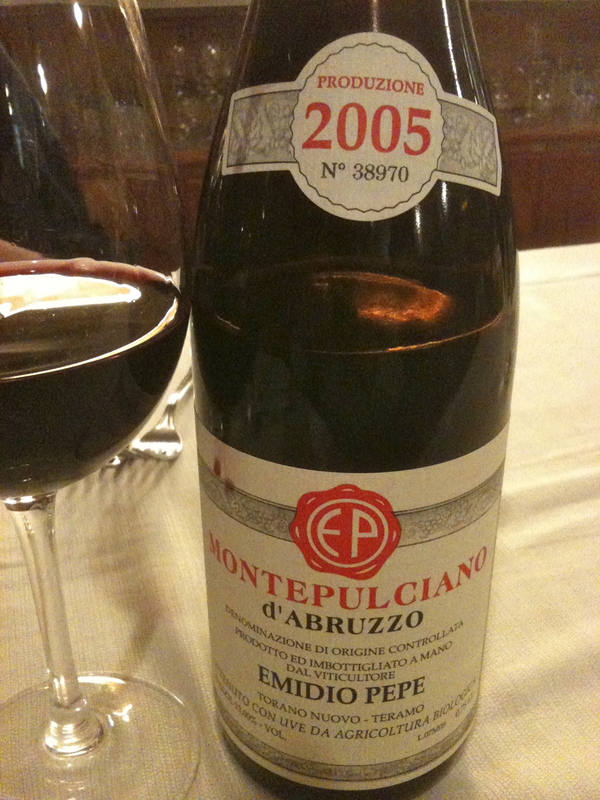 We drank the 2008 Trebbiano d’Abruzzo from Eduardo Valentini. I should have had them decant the wine, as it was still too young. Is located in Cetara, a beach town just outside Salerno. It is famous for its alici! The restaurant has a nice outside terrace overlooking a small square with the town rising in the background. The menu features alici in a number of different preparations. 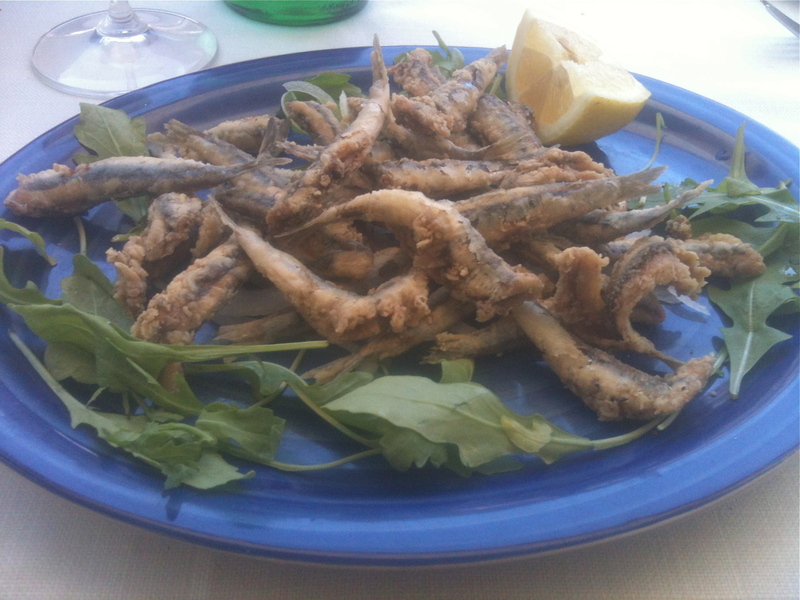 I started with a misto of alici, followed by pasta puttanesca di alici and then alici fritti con cipolla. 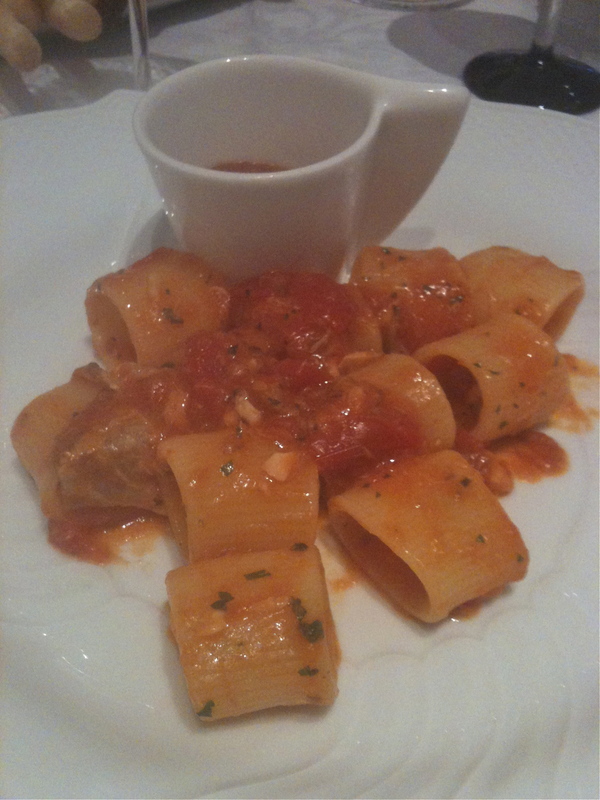 Michele’s first two courses were alici but she said basta alici and for the main course and had seppie arrosta. 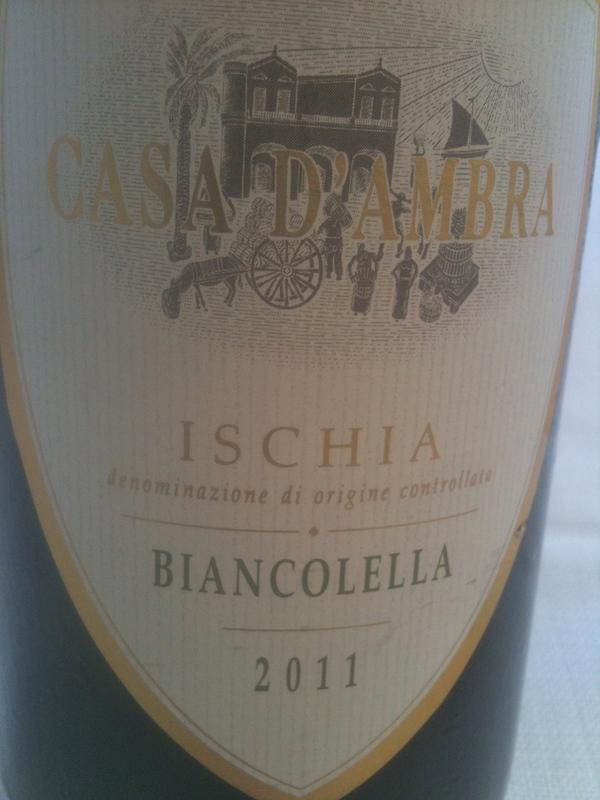 I ordered a sparking Falanghina but they did not have it so I ordered Biancolella Ischia DOC 2011 Made from 85% Biancolella and 15% Forastera, San Lunardo and Uva Rilla Casa D’Ambra. We liked the alici so much that we stopped in a store and brought 2 jars to take home. Trattoria dei Cartari is a very unpretentious restaurant in Amalfi. We had eaten here before but this time it looked a little run down. All of the customers were tourists ordering pizza with beer or with cappuccino. We almost did not go in. When the waiter came over to take our order he almost did not understand what we wanted. He kept on making suggestions and he could not believe that we knew what we wanted and were ordering a full meal. When he realized this he took away the paper napkins and utensils and replaced them with cloth napkins and better utensils! I started with fried alici, moved on to pasta with seafood, grilled langoustine, and for dessert a lemon cake topped with pine nuts. The wine was Falanghina “Serrocielo” 2011 from Feudi di San Gregorio. 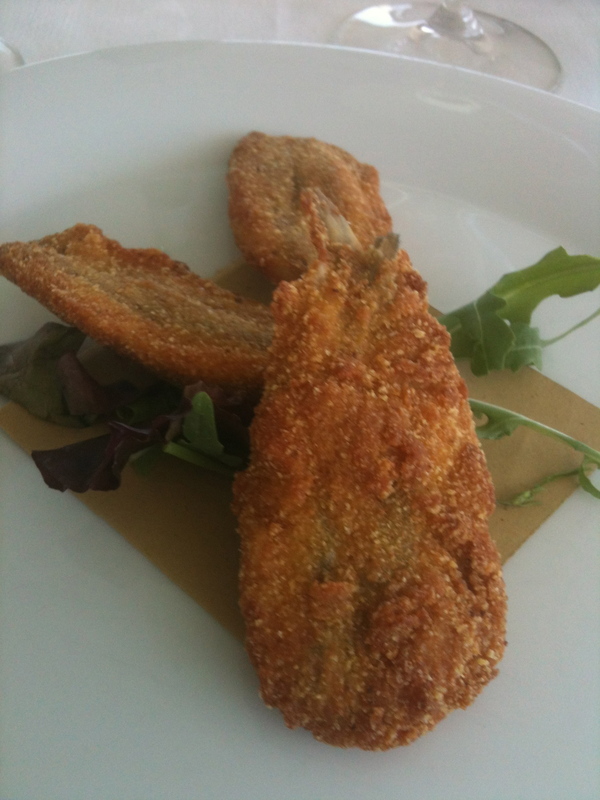 There were many courses, but highlights included a tiny fried alici stuffed with provolain an anchovy and basil sauce. Michele said she could have eaten 5 or 6 of those. 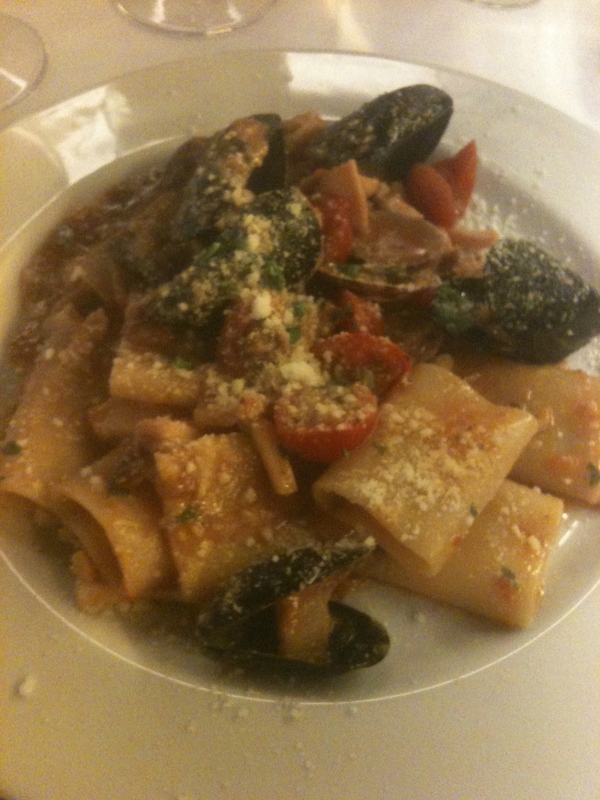 Squid ink ravioli with lobster filling, and pasta with 2 sauces, one spicy and the other with seafood also stood out. As a palate cleanser, they served a creamy lemon sorbet drizzled with extra virgin olive oil. 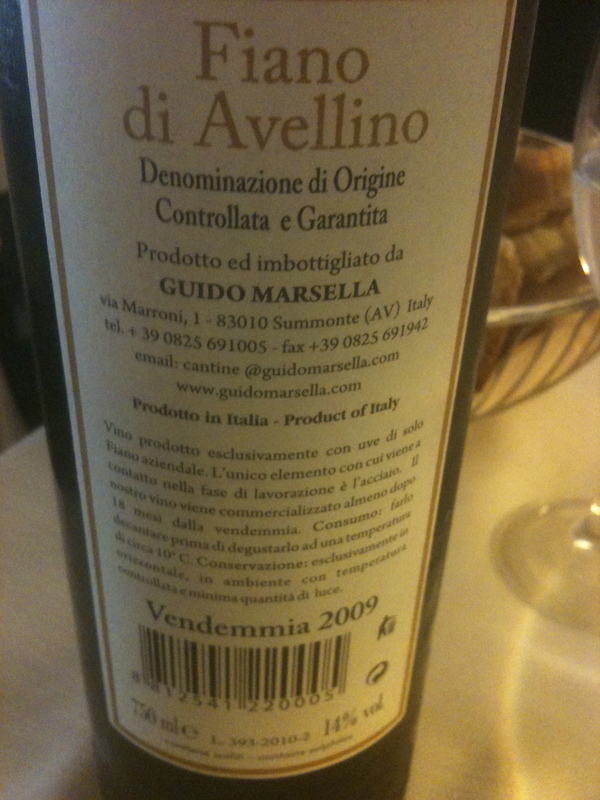 The wine was Verdicchio Classico Riserva 2000 100% Verdicchio Bucci. 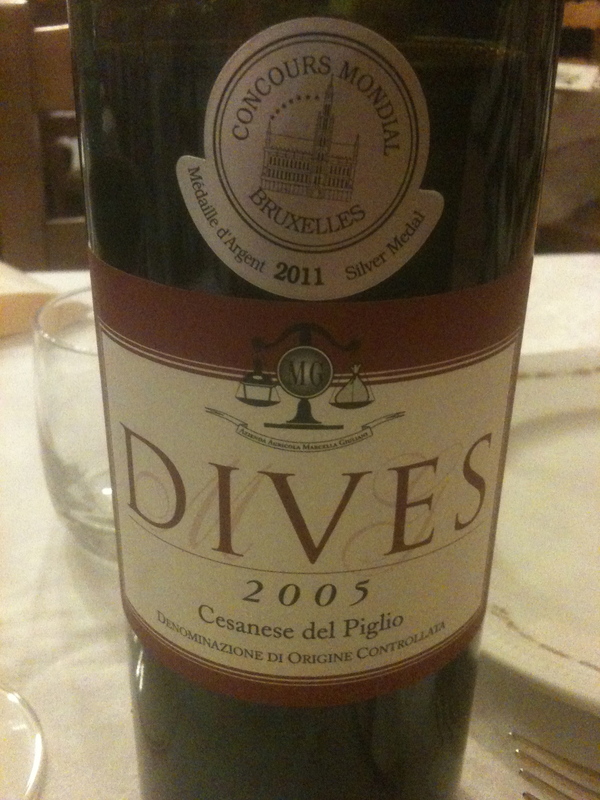 This is a great wine!